This translated edition plays an indispensable role in the administration of justice. It is only through reliable, relevant, and admissible evidence that substantive rights may be established in a court of law. The courts have, over the years painstakingly analysed and interpreted different forms of evidence—written, oral and electronic—in their effort to arrive at the right conclusions. Recent judgments may be seen to be aids for Parliament in amending existing legislation and in formulating new provisions in consonance with the times. First published in 1916, this section wise commentary on the Indian Evidence Act enjoys the reputation of being one of the most authoritative publications on the subject. Several topics have been rewritten and existing comments have been elaborated taking into account the changes brought about by recent legislative amendments as well as judgments of higher courts. Latest and notable cases of the Supreme Court as well as various High Courts have been incorporated. 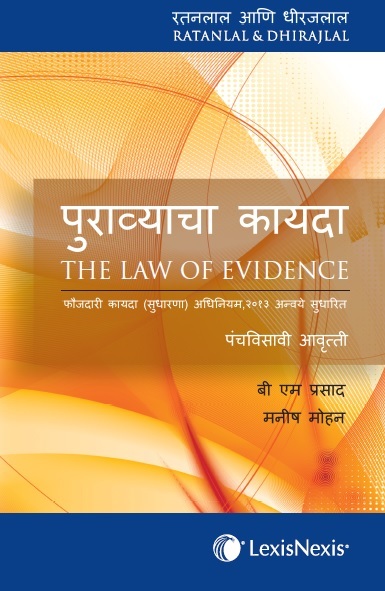 This edition incorporates the changes made by the Criminal Law (Amendment) Act, 2013 and critically analyses the latest case law. This book is invaluable for trial lawyers—civil and criminal—advanced students of law, forensic sciences, criminology, gender studies and human rights.